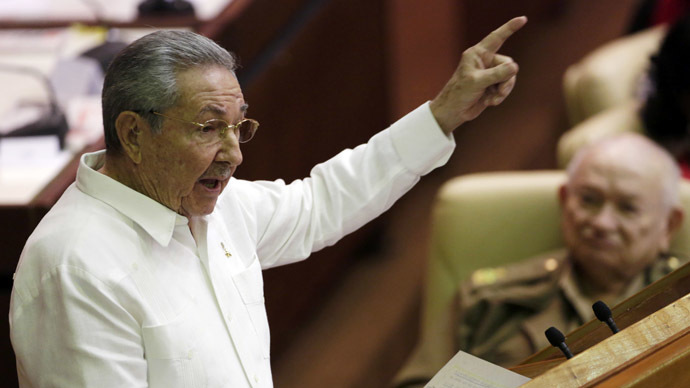 Cuban leader Raul Castro said the country would not give up its political values for which it has fought. Calling for mutual respect in the new development of relations with the US, Castro stated Cuba would continue its socialist route. "In the same way that we have never demanded that the United States change its political system, we will demand respect for ours," Castro told Cuba's National Assembly in a session on Saturday. Having expressed gratitude to Barack Obama for his initiative to open a "new chapter" in the two countries' history by making a decision to lift the blockade, Castro stressed that the US president's move would in no way make Cuba abandon the ideas it has struggled for over half a century. "Cuba is a sovereign country, with its people having determined its path to socialism and its political system by expression of will," Raul Castro said, adding that blood has also been shed to stand for the national ideas. Cuba's communist rule must be respected by US, while the two countries work on advancing their relations, the leader said, adding that his state was ready for the dialogue on a wide range of issues, on terms of "mutual respect." The leader said that he would attend the Summit of Americas next year in Panama, which will be the seventh meeting of the 34-nation bloc, with Cuba to participate for the first time. Castro is expected to have further discussions with president Obama at the meeting, although the list of US delegates has not been announced yet. Having reassured the Assembly and the people of Cuba that the new political turn did not lead to the country renouncing its ideas, the president saluted his older brother, Fidel Castro, closing his speech with "Viva Fidel!" The latter has not been seen since Washington's decision to reset diplomatic ties with Havana and exchange prisoners was announced earlier this week.